Just as the Canon EOS R camera is the first in what will ultimately be a series of different mirrorless camera bodies, the four Canon RF lenses initially being introduced will be part of a growing series of dedicated lenses, supporting full-frame mirrorless imaging. Each of the four RF lenses brings excellent possibilities to Canon photographers. Canon’s RF lenses are one of the major headlines with the introduction of the EOS R system. But a huge part of the EOS R camera is its compatibility with existing Canon EF, EF-S, TS-E and MP-E lenses that thousands of camera enthusiasts own today, using any of three optional Canon EF-EOS R lens mount adapters. 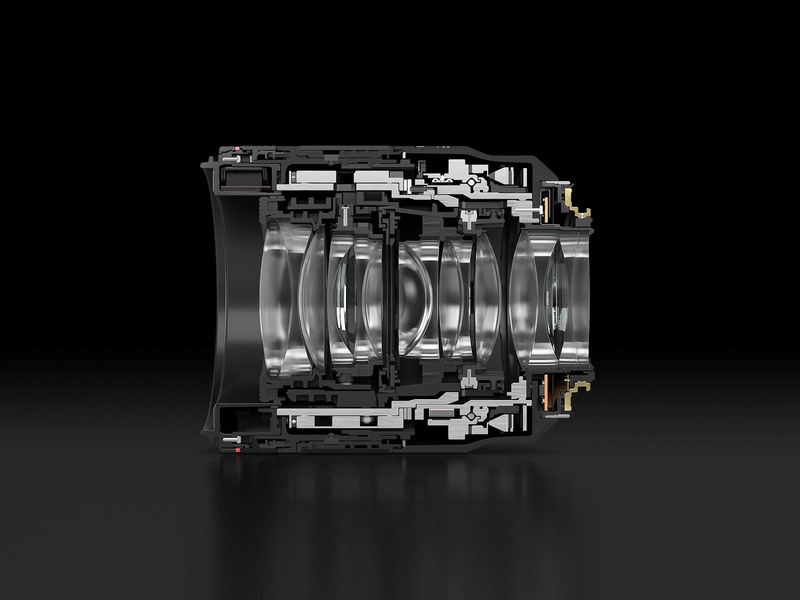 This article will discuss the four new Canon RF lenses in detail. 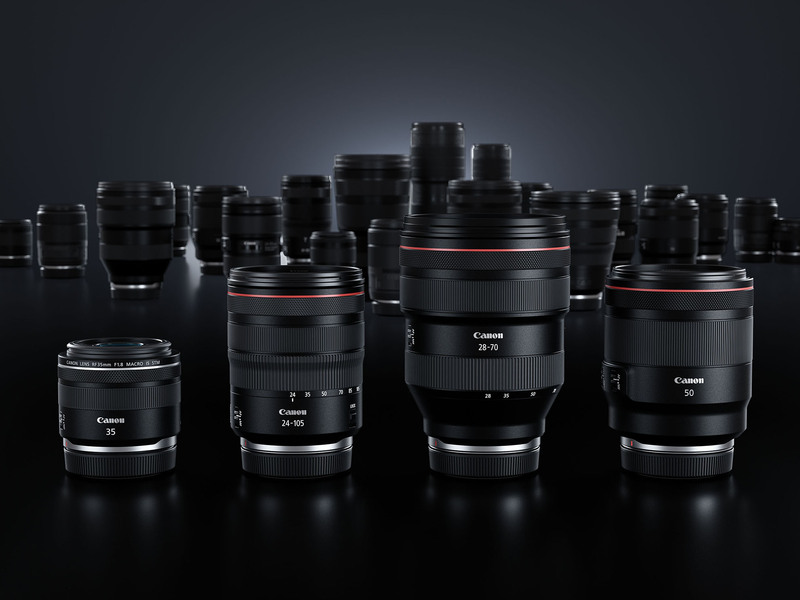 Canon will continue to use the “L” designation on RF lenses that offer special performance optical components. 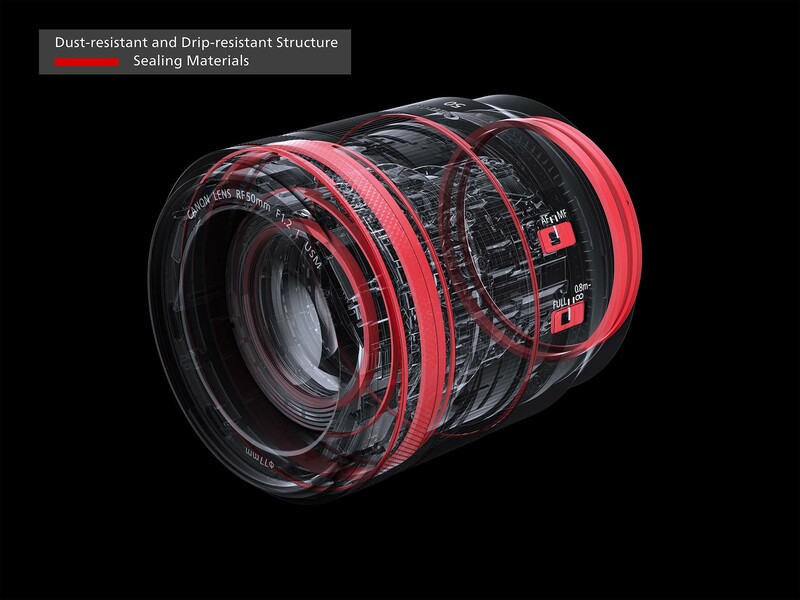 Ground-and-polished Aspherical elements, Ultra-low Dispersion (UD) glass elements, and Fluorite elements (not to be confused with Fluorine coating, used on many lenses now to make cleaning much easier) are among the characteristics of L series lenses. And remember: you can buy an EOS R camera body, with any version of the optional Canon Lens Mount Adapter EF-EOS R, and keep using the Canon EF and EF-S lenses you work with today. You can get the benefits of the EOS R system, and invest in Canon RF lenses as the need arises. Canon’s first standard zoom lens in the EOS R series — the RF 24–105mm F4 L IS USM. This is the first standard zoom lens in the Canon EOS R system, but don’t assume it’s just a kit lens and look beyond it. This constant-aperture lens is totally redesigned optically vs. its EF counterpart. True to form, its rear elements are larger, and accordingly its front elements and overall length are a bit smaller. (Compared to the EF 24-105mm f/4L IS II lens, the RF version is a bit under ½-inch shorter in length, and about 3 ounces lighter.) 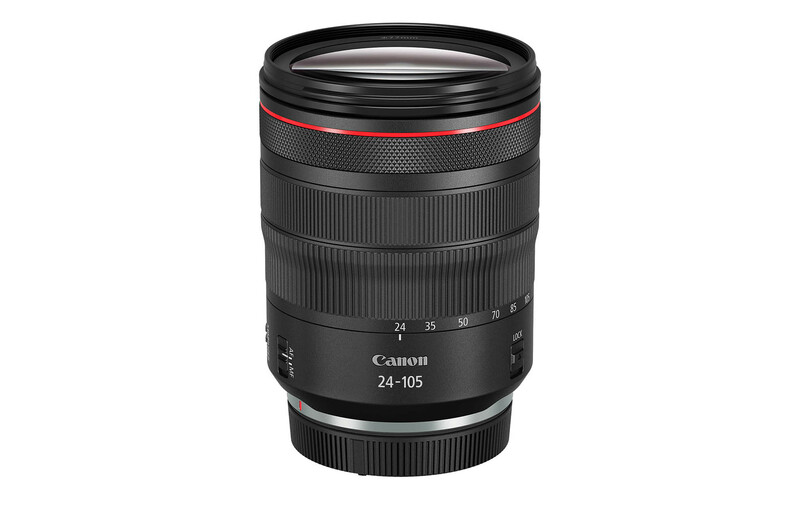 According to Canon’s lens designers, the RF 24-105mm lens is equal or superior optically to the previous EF version. Perhaps most noteworthy, it is the first Canon L series lens to have Canon’s Nano USM focus motor. This very compact AF drive system is especially smooth during video recording, thus making this a potential go-to lens for users who expect video to be a large part of the imagery they create with the EOS R camera. Canon’s tiny Nano USM focus motor is an ideal actuator for compact lens designs. Now controlled by an updated DIGIC 8 processor in the EOS R camera, it is designed into the RF 24–105mm F4 L IS lens, offering both smooth and extremely quiet autofocus for video operation, and quick, rapid focus changes during still-image shooting. Optical Image Stabilization is built into the RF 24-105mm F4 L IS lens, and for still images, provides up to 5 stops of shake-correction (tests conforming to CIPA standards, lens at 105mm, using the EOS R camera body). This can radically open up possibilities for low-light shooting, allowing safe hand-holding at shutter speeds up to 5 stops slower than what your normal hand-held limit would be without IS. For video users, the optical stabilization in RF lenses can combine with the camera’s built-in electronic IS (at the image sensor) for very sophisticated, 5-axis stabilization control. In particular, the very large, low-frequency camera movements (think of a camera operator walking or jogging to keep up with a moving subject) are well-controlled. In fact, Canon expects that many videographers and vloggers will find the combination of the EOS R camera and the RF 24-105mm lens to be a dynamic and frequently-used combination. Optically, this is a sound L series design. It’s an 18-element lens, highlighted by three Aspherical lens elements, combined with a UD (Ultra-low Dispersion) glass element, countering a variety of aberrations including chromatic aberrations. 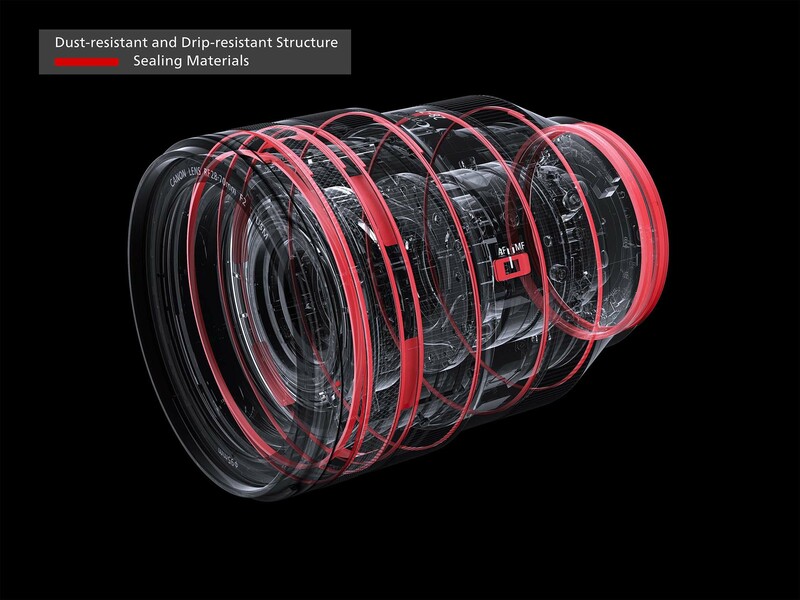 And, Canon’s Air Sphere Coating (ASC) is added to the front surface of the 7th element. ASC combines with Canon’s Super Spectra Coating (SSC multi-coating), providing excellent protection from lens flare in backlit situations. 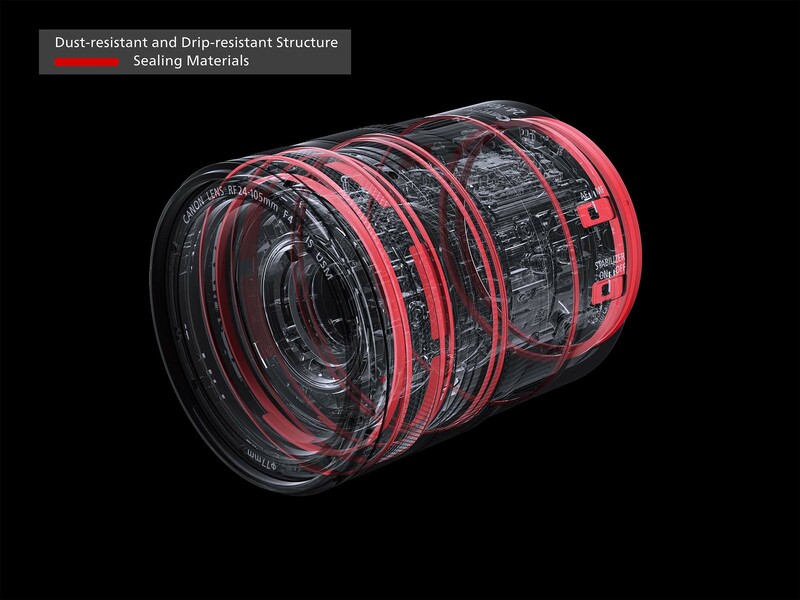 Here’s a cutaway view of the RF 24-105mm F4 L IS lens, giving an idea of its sophisticated design. Note the relatively small size of the front (left side) lens elements, a direct result of the wide Canon RF lens mount, and the corresponding wide-diameter optics at the rear of this lens. Minimum focus is 1.48 feet (0.45m), and at the 105mm zoom position, maximum close-up magnification is 0.24x (nearly ¼ life-size). At its nearest focus distance with the full-frame EOS R camera, you can fill the frame with an object about 5.6 x 3.8 inches in size — about the size of a typical postcard. It accepts 77mm filters, and is compatible with the Canon 77mm Close-up Lens 500D…maximum magnification at the 105mm position, with the lens set to its nearest focus distance, is 0.39x. The lens is bundled with a new, dedicated Canon EW-83N lens hood (a locking, bayonet-attachment hood), and a Canon Lens Case LP1319. We go into detail in a separate “What’s New” article in this series, but like all Canon RF lenses, the RF 24-105mm F4 L IS USM has a Control Ring at the front of the lens, giving users immediate access to their choice of exposure control — lens aperture, shutter speed, ISO, or Exposure Compensation. The user makes his or her choice in the camera’s Custom Functions menu; by default, the Control Ring has no effect as it’s rotated. Here’s an example of using the mirrorless architecture of the RF mount to create a fixed focal length lens that’s smaller in size than the well-regarded EF 35mm f/2 IS USM, even though it’s 1/3 stop faster — and offers macro focusing. It’s a great, practical alternative — or addition — to a standard zoom lens. The lightest and most compact of the initial four Canon RF lenses is the RF 35mm F1.8 IS STM. Its size alone makes it a great match with the EOS R camera, for classic street shooting, travel, and as a compact standard-lens alternative to zooms. 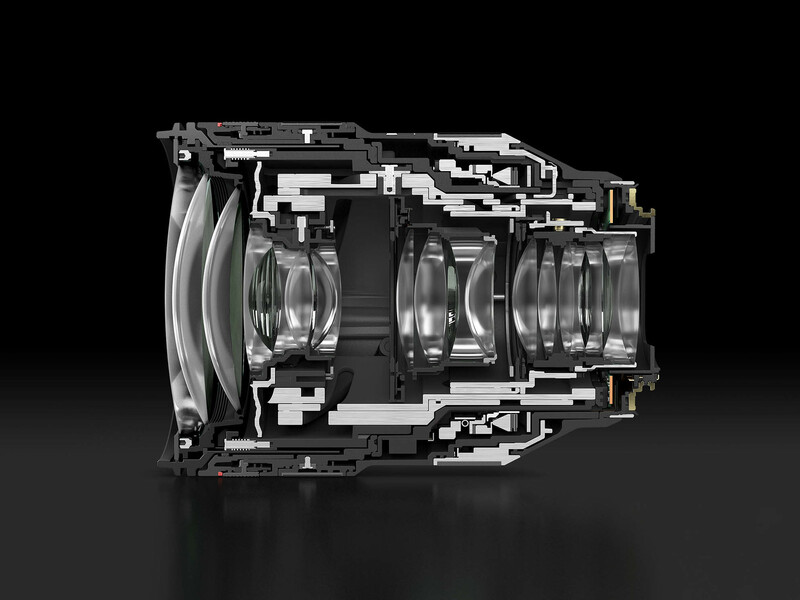 Note the diamond-textured Control Ring, at the front of the lens — a feature common to each of the RF lenses introduced in 2018. Moderate wide-angle lenses have been a classic, go-to choice for serious enthusiasts and pros, for travel, street photography, and photojournalism. With its compact size, this lens is a natural addition to the compact Canon EOS R camera. At f/1.8, it’ll offer two stops or more light-gathering than many compact standard zoom lenses (typically around f/4~5.6), so it’s a great choice for available light shooting. It provides up to five stops of optical Image Stabilization, and combines with the in-body, electronic IS in the EOS R camera to deliver Combination IS during video recording — very useful for reality TV-type recording, where the camera operator is on the move. And, a very compact stepping motor (STM) focus drive further enhances its video performance. 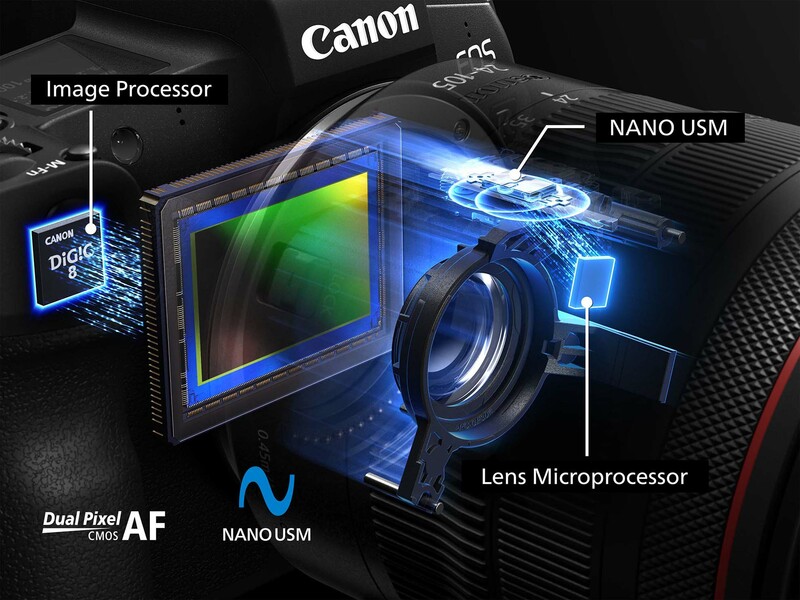 STM focus has proven itself to be especially smooth and positive during video recording, when teamed with Canon’s Dual Pixel CMOS AF system. For still shooters, it remains a brisk performer, with the added benefit of extremely quiet focus operation. And, unlike any previous Canon wide-angle 35mm lens for full-frame interchangeable lens cameras, it offers macro focusing. Its minimum focus distance is less than 7 inches (17cm), and maximum magnification of 0.5x — half life-size, sufficient to fill the frame with a business card. As a macro lens, it is fully compatible with Canon’s Macrolite flash units (both Macro Ring Lite, and Macro Twin Lite units). They can attach directly to the front of this lens, without accessory adapters. Beyond its excellent low-light capability and compact size, this lens offers close-focusing down to 0.5x magnification — half life-size. And, it’s not a lens that needs to be stopped down to small apertures to produce sharp macro images. 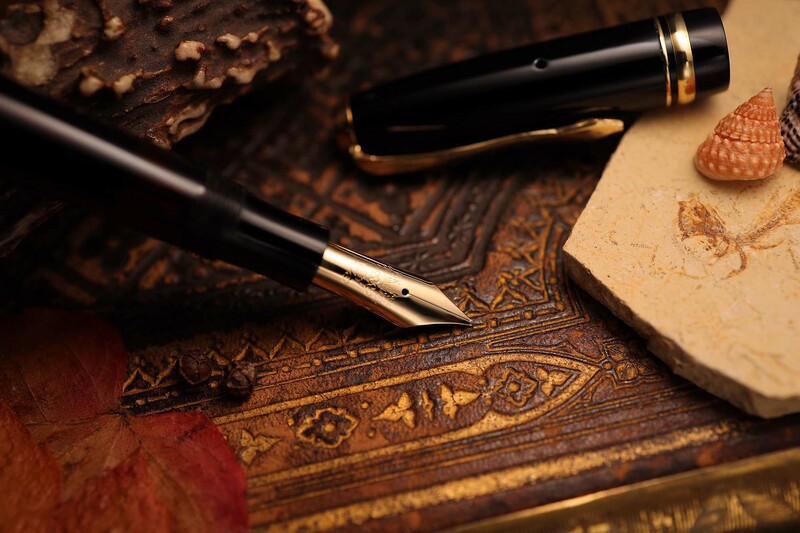 The vertical shot here was taken at f/2.5, and the horizontal shot of the pen at f/4. Macro focus capability truly makes the RF 35mm F1.8 STM an extremely versatile lens for many different types of photographers. 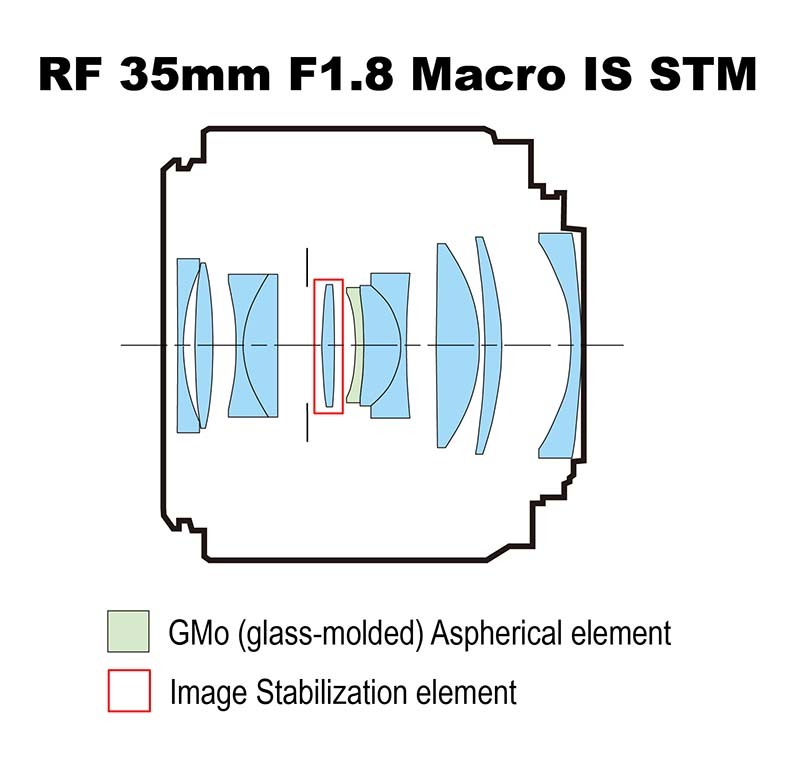 Optically, the RF 35mm F1.8 Macro IS STM is a classic example of the benefits of the EOS R system’s new RF mount, and mirrorless structure. 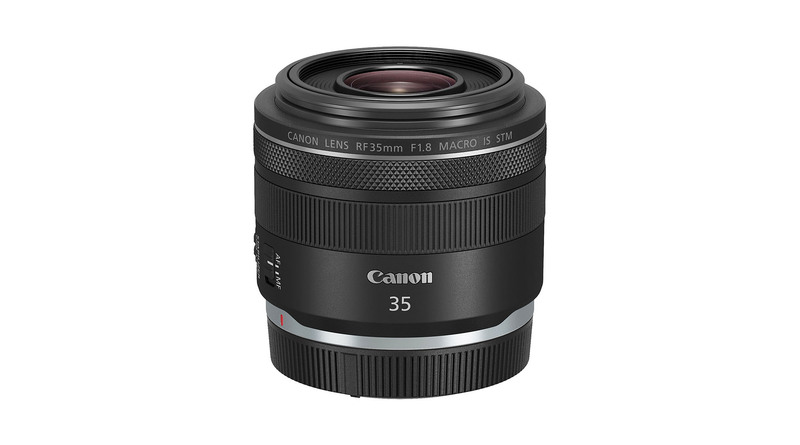 Compared to the (well-regarded) EF 35mm f/2 IS USM lens, the larger rear optical components in the RF lens allow the front section of the lens to be noticeably smaller — and the overall length and weight to be reduced as well. And with this, the lens actually gains 1/3 stop of lens “speed,” along with a huge gain in close-focus capability. In other words, the combination of a large-diameter lens mount, and the lens being moved much closer to the image sensor, completely change the design dynamics for the lens’ designers. Smaller, lighter lenses with equal or better optical quality are one route the designers can take, and that was done with this new RF 35mm F1.8 IS lens. The optical design of the Canon RF 35mm F1.8 IS STM is a classic example of the benefits of a large-diameter rear section (at the right in this illustration). With the larger rear section, the entire front of the lens can be smaller (making the entire lens smaller than the EF 35mm f/2 IS USM lens), while still allowing its maximum aperture to be 1/3-stop faster at f/1.8. And on top of that, the optical design permits close-focusing to distances normally not possible with traditional 35mm, moderate wide-angle lenses. This lens accepts 52mm screw-in filters. Canon’s 52mm Close-up Lens 250D can be used, and extends the close-up magnification up to a max of 0.62x, without any light loss. While the lens does not ship with a lens hood, an optional Canon EW-52 screw-in hood is available as an accessory. Another route that lens designers can go with Canon’s RF lens mount and mirrorless design is to provide extremely high specifications (an f/1.2 maximum aperture, in this case) along with absolutely outstanding optical performance. 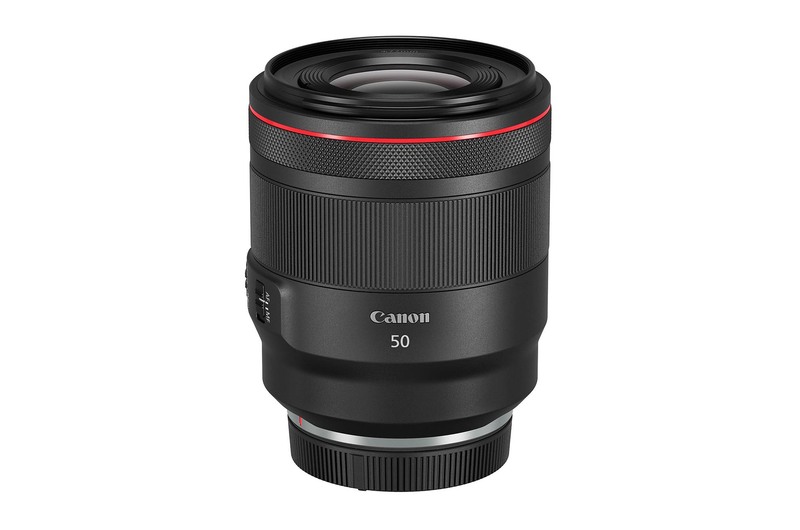 This is a primary foundation of the EOS R series, and the RF 50mm F1.2 L USM is a strong statement of Canon’s belief in optical performance being a cornerstone of this system. A powerhouse for available-light shooting, the RF 50mm F1.2 L USM will be of great interest to many different types of advanced photographers, including fashion, weddings and events, portraits, and of course low-light images. As with each of the RF lenses launched in 2018, note the Control Ring, just under the distinctive red L series ring. This lens is without question the finest 50mm lens from Canon to date, and brings superb optical performance and exceptional, f/1.2 speed to the serious enthusiast or working professional. It’s an example of using the mirrorless structure not for compactness, but to maximize image quality and provide absolute pro-level, low-light performance — along with outstanding f/1.2 “speed.” A thoroughly professional lens that should come into its own for wedding and event shooters, portraits, fashion work, and of course many available-light video applications as well. It truly embodies the optical excellence upon which the EOS R system is based. Like the other RF lenses being introduced with the EOS R camera, this lens uses electronic manual focusing. Combined with the available manual focus aids in the EOS R’s electronic viewfinder, some critical users may find manual focus to be a quick and viable option for fast, sharp images, especially in low light. And that is where any f/1.2 lens will excel. Compared to an f/4 zoom lens, the f/1.2 lens brings in 3-1/3 stops more light. In a low-light situation, that’s the difference between shooting at ISO 6400 and ISO 640. With the EOS R camera, AF is possible down to an incredible EV -6 with this lens (ISO 100, single point AF at center, One Shot AF, at 73°F / 23°C). That’s roughly 3 stops more AF sensitivity in super-low light than we’ve experienced with existing Canon EOS digital SLRs, as of late 2018. The combination of its outstanding low-light capability, and beautiful “bokeh” — out-of-focus backgrounds — gives images at wide apertures a distinct look, and is at the heart of this lens’ appeal to the serious, dedicated video and still-image shooter. 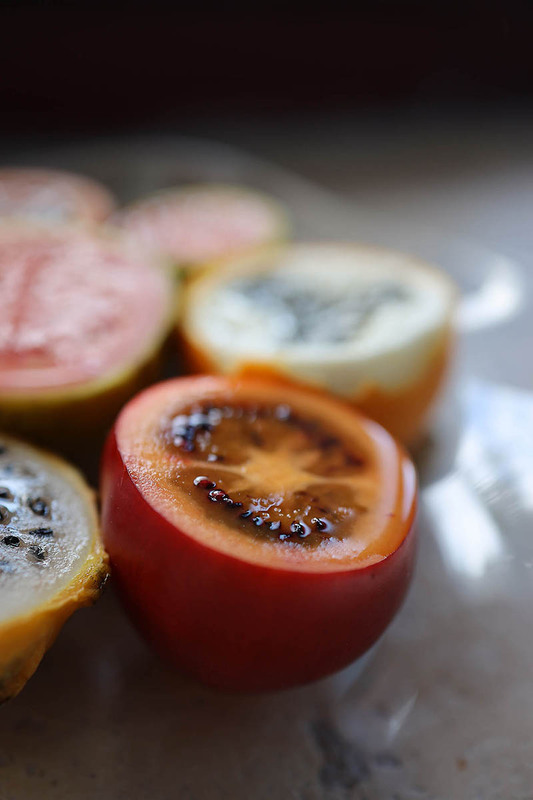 This shot was taken at f/1.2, the lens’ widest aperture. In particular, we expect portrait photographers to get excellent, consistently-sharp pictures when this lens is combined with the EOS R camera’s Eye Detection AF, which puts sharpest focus with human subjects on the eye nearest to the camera. Optical highlights include three high-refraction Aspheric lens elements (two ground-and-polished elements, and one glass-molded Aspheric element), along with one UD-glass element to control chromatic aberrations. In addition to multi-coating throughout the lens, Canon’s Air Sphere Coating (ASC) is strategically added to the 4th lens element, to enhance protection from flare and ghosting, especially in back-lit conditions. 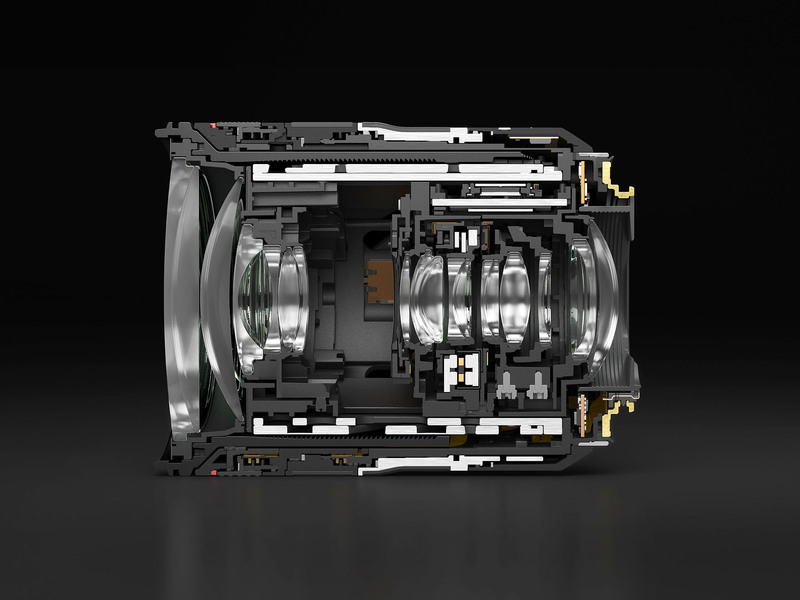 A cutaway view of this outstanding lens puts its optical layout on full display. 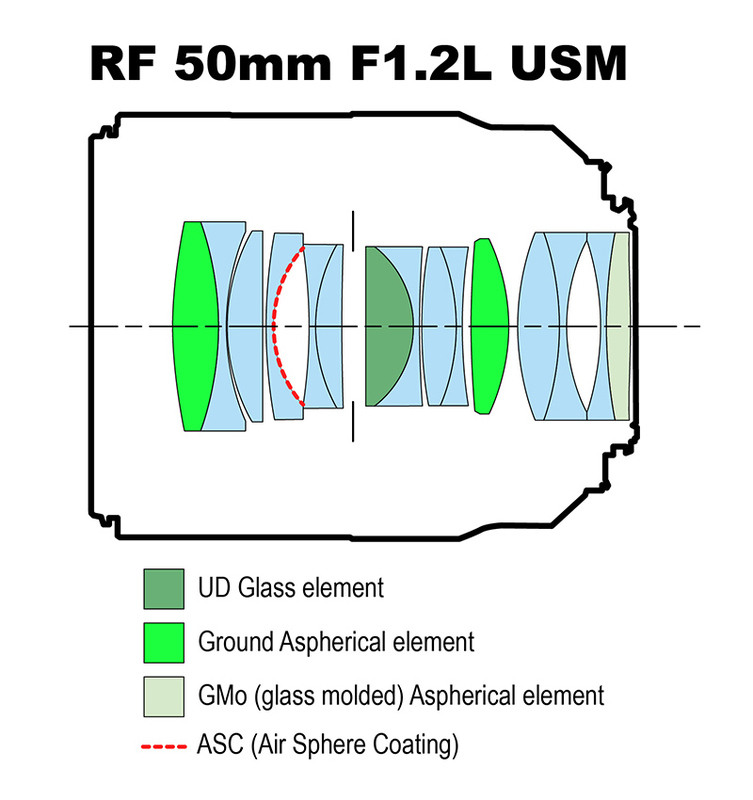 In the lens diagram illustration, the special-purpose lens elements are identified, along with its ASC (Air Sphere Coating) at the rear surface of the 4th lens element. True to its L series heritage, the RF 50mm F1.2 L USM is extensively gasketed and sealed, to help protect it from harsh conditions. Maximum protection from dust and moisture can be achieved if a 77mm filter is attached to the lens, to effectively prevent intrusion of foreign matter at the front section of the lens. In addition, the RF 50mm F1.2 L USM uses a powerful ring-type Ultrasonic Motor (USM), and the already outstanding “bokeh” or background blur inherent in an f/1.2 lens is enhanced by a 10-blade aperture mechanism, with curved aperture blades for more circular rendering of out-of-focus highlights. As just mentioned, the lens accepts 77mm filters, and is bundled with a dedicated Canon ES-83 lens hood, which bayonet-mounts onto the lens. The hood includes a lock to secure it to the lens, and a release button. A lens case LP1319 is also included. • The maximum aperture is indeed f/2…that’s not a typo. And, it’s a constant-aperture lens, so that f/2 max aperture is present from 28mm thru 70mm on the zoom ring. Canon’s fastest zoom lens to date is this optical powerhouse. It’s not simply a statement of how “fast” a lens can be designed; the design goals of Canon’s engineers was to provide absolutely outstanding optical performance as well, even at its widest f/2 aperture. 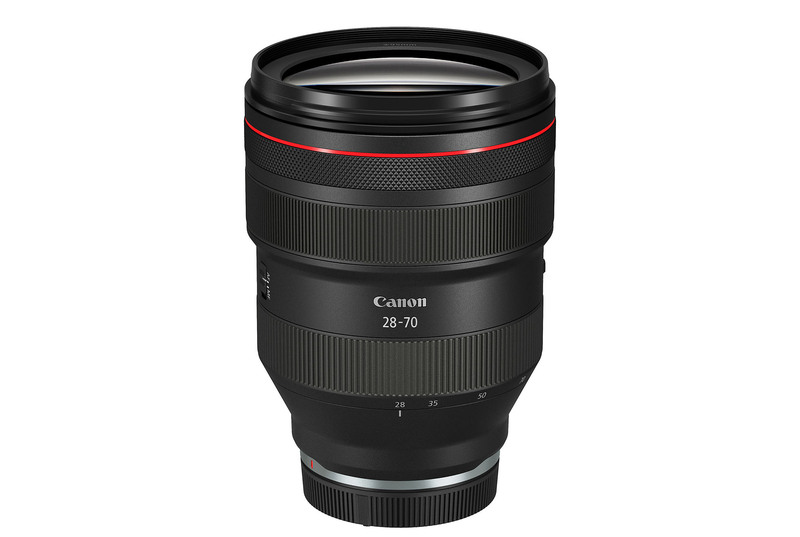 This lens is an incredible optical design, again leveraging the possibilities opened up by the large-diameter Canon RF lens mount and its 20mm position from the image sensor (vs. 44mm with Canon EF lenses, designed for SLRs with a mirror box). While there’s no question this is a large and heavy lens, Canon engineers have clearly stated that a lens with these specs would have been far larger and heavier had they tried to design it around the EF lens mount. Remember, with the combination of a large-diameter rear section of the lens and it being closer to the image sensor, the entire front section can be reduced in size and maintain, or even improve, optical performance. And this lens is expected to excel in optical performance. Even wide-open at f/2, Canon engineers expect this lens to match or exceed the performance of the finest wide-to-tele zooms on the market today, and in fact to be a match for many fixed focal length lenses. It should be well-received by pros and serious photo enthusiasts, and be a great choice for weddings and events, available-light shooting, landscape, and travel imagery, when teamed with the Canon EOS R camera. This lens should be a magnificent lens for portraits, for users looking for standard to short tele composition and perspective. This shot was taken at f/2, with the Face Detection + Tracking and Eye Detect AF active — two features which Canon is confident even the most serious of portrait, wedding and event, and fashion shooters will come to rely heavily on with the EOS R camera. Optically, this is an L series tour-de-force, with 19-element construction, four Aspheric lens elements, two UD (Ultra-low Dispersion) glass elements and a Super UD element. In addition to Canon’s SSC multi-coating throughout the lens, both SWC (Sub-wavelength structure Coating) and ASC (Air Sphere Coating) on the fourth and 17th optical elements, respectively, for outstanding control of flare and ghosting, especially in backlit shooting situations. There’s no way around an f/2 lens of this type being a large design, even with the benefits of the Canon RF mount. It uses 95mm, screw-in filters at the front of the lens, and it weighs about 3.2 lbs. (1430g), roughly the same as a Canon EF 70–200mm f/2.8L IS II lens. However, the weight is well-balanced, and while users will likely always know there’s a big lens mounted on the EOS R camera when it’s attached, many will probably find it’s not excessively front-heavy. At the time of its launch, Canon makes no accessory tripod mount for this lens. And, to be clear, this lens does not have optical Image Stabilization in the lens. Video users can use the electronic, in-camera stabilization in the EOS R camera to achieve stabilization during video recording. Minimum focus is 1.28 feet (0.39m), with a maximum magnification of 0.18x at its 70mm zoom setting and nearest focus distance. In addition to the lens’ manual focus and zoom rings, there’s a new Control Ring, at the front of the lens — the same ring appears on each of the Canon RF lenses introduced in 2018. Users can go into the EOS R camera’s Custom Functions menu, and tailor this ring to allow either instant exposure adjustment, or adjustment when it’s rotated while the shutter button is pressed halfway down. The current possibilities are adjustment to ISO, Exposure Compensation, shutter speed, or lens aperture. Especially with fewer control buttons on the EOS R camera body, the Control Ring adds another dimension to intuitive, rapid control with RF lenses on the EOS R camera. The lens offers weather-resistant construction, and a 9-blade aperture that can stop-down to f/22. With its combination of unprecedented f/2 speed (among standard AF zoom lenses for full-frame cameras), superb optical quality, and manageable size and handling, Canon expects the RF 28–70mm F2 L USM lens to be one of the flagship products in the EOS R system, and a lens which will open new doors for creative imagery in the hands of critical camera operators. 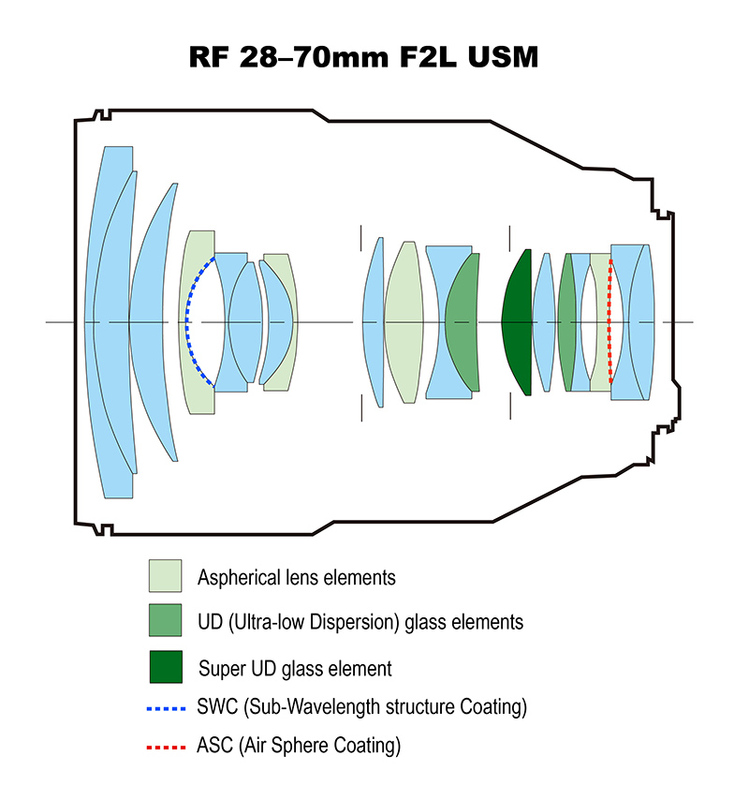 A look at the weather-resistant structure of the RF 28–70mm F2L USM lens, giving it protection from moisture and dust equivalent to recent EF L-series lenses.